This is our 1st newsletter for 2010 – our lucky 13th year! Thank you for your business and referrals that have been key to our longevity. Our kennel of friends would not continue to grow without you. We never tire of carving the wooden dogs that have been the mainstay of our business for longer than the 13 years we’ve been at Dog Bark Park. Nor do we weary of meeting visitors and guests to the big dog that has brought us a bit of world-wide fame – Dog Bark Park Inn Bed & Breakfast. Sweet Willy welcomes his first 2010 overnight guests in early April. Hard to believe this is the big dog’s 8th season! Reservations are coming in at a good pace. Happily, more people stay every year. So far this year our bookings include several international visitors, some interesting small groups, and families from across the country. Unlike the price of gas or cost for a bag of dog food, our rates will not change for the 4th year running. Be assured our amenities remain the same; our fresh and home-prepared breakfast & snack selections are as plentiful as ever. Only things we have cut are the dog’s toe nails & our hair! With Spring arriving early this year, we’re busily sprucing things up both indoors and out. A new patio floor for the giftshop entry is underway. We’ve re-painted and re-arranged the giftshop/office, adding some new products as well, like the cutest artisan-crafted glycerin bath soaps decoratively embedded with dog portraits! In the big beagle, Sweet Willy has received a thorough grooming with some new touches added as well. Please join us for a 3-minute visit complements of the Purina Company. Last November, a videographer on assignment for Purina visited with us on the snowest day of winter. To view the video click here. Nearly 48,000 people have viewed it already, making it one of Purina’s most successful video clips. A 30-member film entourage and the family descended on Dog Bark Park in two motor homes for part of a day last June. The weather was perfect Idaho gorgeous and the cameras rolled while the adventurous family looked about & visited. This day was another example of the job benefits Dennis & I are grateful to enjoy – meeting new people and the new experiences that result. Last October’s newsletter included pictures of the giant Corning Ware-like coffee pot that we built in early 2009. 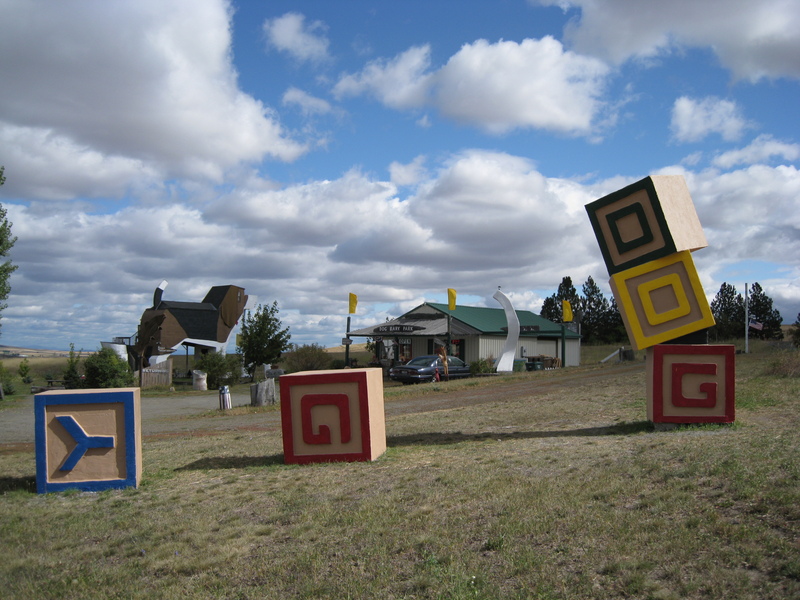 Late last summer Dennis finished his second giant pop art installation for the year – oversized Alphabet Blocks! They, like the coffeepot, are modeled after objects of yesteryear, in this case painted wooden alphabet blocks with raised letters and borders. These are a bit difficult to stack or re-arrange since they’re made of concrete and each letter is 4-ft square! Construction-wise, the blocks were a more challenging endeavor than building the giant coffeepot. Fashioning the wood forms needed for pouring the concrete so that the letters and borders protruded beyond the flat background surfaces of the concrete blocks was not quick or easy work. Additionally, it was no small feat to wrestle & secure the heavy bulky forms into position without having them tip over as the optical illusion suggests. We’re not sure what big outdoor sculpture might be next. So far, we’re focused on preparing for the new concrete patio entryway – an on the ground rather routine project! No doubt, once that’s done we’ll be scratching the ground for another “fun” art project. These snapshots are from Dog Bark Park visitors and customers.We invite you to e-mail your favorite digital memories of a visit to Dog Bark Park or of your dog with its wooden companion. Be sure to include a little background info as well & we’ll post your pictures in a future newsletter. This series of photos illustrates the transformation of Idaho pine into a wooden dog. Apollo, a custom order was made to approximate the real dog by the same name. We attempted to highlight the unique features of the furry Apollo that will best make our carved rendition recognizable. We emphasized Apollo’s black eye patch, his alert ears and the overall mottled appearance of his coat. Ilove this carving of Apollo this is great work. I would love to have one of my dog. Thanks for sharing! So glad you enjoy our canine artwork. We’d be happy to create a custom carving of your dog. E-mail a few photos of your dog so that we may determine possibilities. Working on a white german shepherd right now that has unusual ears. Thanks for being in touch. Will look forward to hearing from you again.